"Wonderful chewy Christmas cookie bars." In a medium bowl combine butter, white sugar, brown sugar, flour, baking powder and salt; mix well. Spread 2/3 of mixture into prepared pan. Combine remaining mixture with oats and walnuts; sprinkle over jam layer. These bars are delicious! They are very rich and go well with holiday baking! 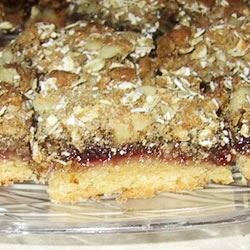 Great raspberry bars! I used Solo raspberry pastry filling instead of jam and they were delicious!